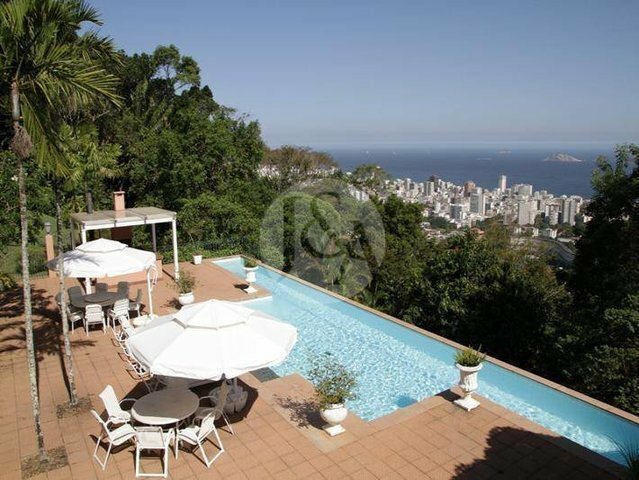 Spectacular property in Gávea embraced in privacy with views to the ocean. This property is the perfect balance of sophistication and comfort! Its 17.222 square feet area is divided to entrance hall, living room with fireplace, dining room, media room with acoustics, lunch room, powder room, open verandah, balcony, wine cellar, study room, two private rooms, five bedrooms featuring four ensuite bathroom, closet, two full bathrooms, equipped kitchen, eating area, two pantries, dish cabinet, service area, two staff's quarter with bath and terrace. Leisure area with a beautiful view, swimming pool, steam sauna, barbecue area, wood oven for pizza, eating area, game room, fitness room, garden ad lawn. The extensive 1,43 acres land also offers nine parking places and a caretaker's house. It is situated on a quiet street with security.